For the past 10,000 years, Earth has enjoyed a relatively warm and stable interglacial period. Historians and scientists even speculate that the present global climate conditions enabled human civilization to flourish. At some point in the future, however, the planet will slide back into another ice age. The transition into the last ice age occurred gradually, according to new data from an ice core in Greenland  perhaps presaging how Earth's next glacial period will begin. The Danish-led North Greenland Ice Core Project (NGRIP) extracted more than 3 kilometers of ice, providing climatic and atmospheric information for the past 125,000 years. The core is particularly important because it captures the onset of the last ice age, approximatley 115,000 years ago. "This is the first ice core we have that contains, in detail, that time period where you go from the last interglacial period to the glacial period," says Jim White, a paleoclimatologist at the University of Colorado, Boulder, who co-authored a paper on NGRIP that appeared in last week's Nature. 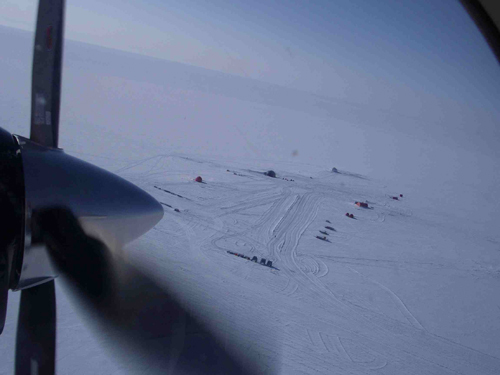 In this aerial photo, a few small shelters and snowmobiles mark the site of the North Greenland Ice Core Project. The Danish-led research team recovered more than 3 kilometers of ice, equivalent to almost 125,000 years worth of climate data. The time period recorded includes the transition from the last interglacial period into the last ice age. All images courtesy of Jim White. Researchers have drilled previous ice cores in Greenland, but ice records were disturbed at depth, where the oldest layers are located. Choosing a site to drill is a compromise between depth and resolution, says Jerry McManus, a paleoceanographer at the Woods Hole Oceanographic Institute, who is not directly involved with the research. In places that receive a lot of snow, the seasonal ice record is thick and the resolution is high, he says. However, the ice record is shorter and the oldest, deepest ice is prone to folding and distortion. Places that receive less snow have thin seasonal layers, making them harder to analyze, McManus says, but the ice record is longer, so interesting parts of the ice record appear higher in the core, hopefully above any deformation. By choosing a site to the north of the previous cores, the NGRIP team was able to see further back into the past, all the way to the last interglacial period. The findings were somewhat surprising. "We expected to see some sort of trigger, but at the beginning of the ice age, there was just slow gradual cooling," White says. Scientists had thought the transition between interglacial and glacial periods might be marked by an abrupt temperature change, he says. McManus says that a gradual shift in global climate is reasonable at the beginning of glacial periods. "It takes a while to build large ice sheets," he says. "It can't happen very fast because you're limited by how much it snows." At the end of an ice age, however, "warming is remarkably rapid," he says. 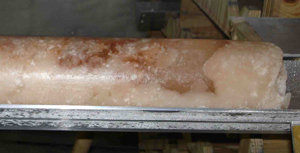 The bottom portion of the recently retrieved Greenland ice core was filled with a mysterious pink ice and contained small pieces of organic matter. Biologists will return to the ice core site for future study of the organic matter. Although the NGRIP researchers recorded the transition into the last ice age, they were hoping for an even longer ice record. But, the very bottom of the glacier, containing a few thousand years of the oldest ice, had melted. "It was something of a shock," White says. "The water at the bottom was unanticipated." Robert Mulvaney, a glaciologist with the British Antarctic Survey, says that it is not uncommon to find water at the base of an ice sheet. "It acts like a blanket, trapping heat," he says. Researchers are now looking to drill another core farther to the northwest to get at the oldest ice records, which they suspect have not melted away yet. Although the bottom of the ice sheet has melted, the researchers did uncover some unlikely objects underneath the glacier. The last portion of the ice core contained strange pink-colored ice that was laden with mysterious organic matter. "We drilled through thousands of feet of white or clear blue ice," White says, "then up comes this pink ice." He says the organic material in the ice looks like pine needles or blades of grass. If the material was not introduced by contamination, the organic material may be left over from when Greenland was still green. "I don't know for sure, but my gut feeling is that they may have something extremely old," Mulvaney says. The last time Greenland was not covered by glaciers was a few million years ago, White says. On the next trip to the NGRIP drilling site, biologists will determine what the organic material is and examine the strange pink ice for microbial life.